Home › Archive by Category "Digital Government"
Many regional governments in Italy have tried to solve the problem of coordinating different levels of government and different local ICT policies through the creation of ad-hoc public companies. These companies are owned by the regional government itself or by a consortium of local actors, and have the goal to ensure more flexibility and specific capacity in providing advanced services to provinces and municipalities. This raises questions about their actual efficiency and effectiveness. A paper with Chiara Assunta Ricci provides a brief overview of recent e-government policies of the Italian regions with a focus on the coordination models between local actors. 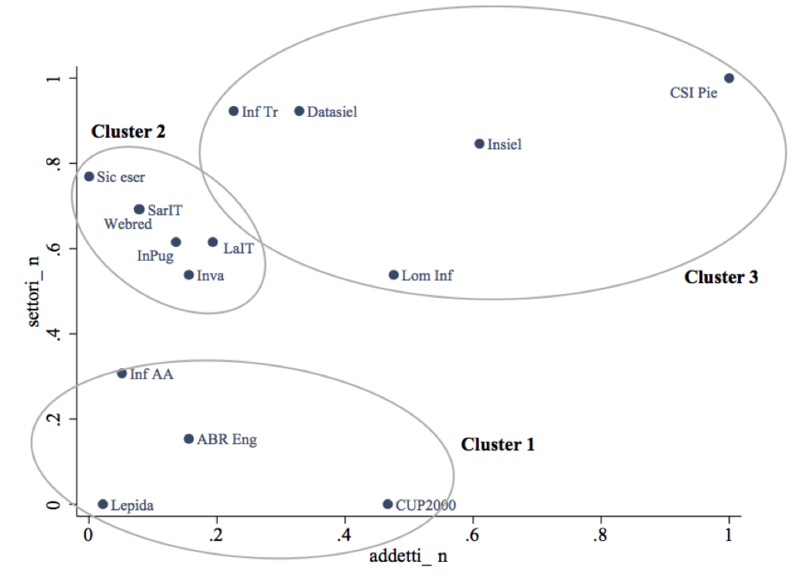 In particular, the role of regional information technology (IT) public companies is explored through a cluster analysis based on evidence from an ad hoc survey. 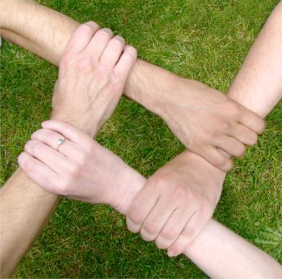 Advantages and disadvantages of the different coordination models are discussed. In particular, two composite indices are employed: (i) an index of the intensity of coordination at the regional level; (ii) an index of effectiveness of IT policies, measured as the level of advancement of municipalities in the use of ICTs. The two indices are then compared with the coordination models adopted. Preliminary results show a positive correlation between the two indices, while the presence of an IT public company does not appear to significantly affect either the IT performance nor the level of coordination. Here is an earlier (full) version of the paper (in Italian), presented at the XXXIII Annual Scientific Conference of the Italian Regional Science Association (AISRe), Rome, Italy. Here is the final version published in Economia e Politica Industriale – Journal of Industrial and Business Economics. The debate on composite indicators or synthetic indices in the e-government field has been ongoing since the publication of the first benchmarking exercises at the EU level back in 2002. Many analysts and researchers consider composite indicators as “black boxes” (see for example this paper by Frank Bannister, 2007). We put in still intelligible indicators and what comes out is a mysterious number, and, inevitably, a mysterious rank. 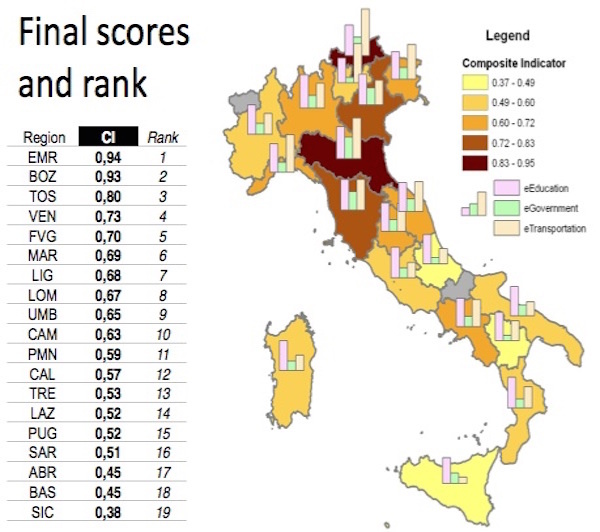 The feeling is that it’s a weird combination of voodoo (or too complicated math), subjectivity, weak frameworks, unbelievable results (can you really believe that Italy has put 100% of public services on line with the highest possible level of interactivity?). A 3-days seminar at the JRC-IPSC of the European Commission opened my mind. There I found a motivated and high-skilled team coordinated by Andrea Saltelli, which, by the way, was responsible for drafting the OECD-EC Handbook on Constructing Composite Indicators. While it was clear to me that things like data quality, framework reliability and transparency – when it comes to show how the results have been computed – are always crucial, I learned that composite indicators quality and robustness can and must be checked, and that more advanced and reliable techniques can be applied. I suspect that if we applied tools such as the Sensitivity Analysis or the Uncertainty Analysis to the existing “black box” indicators we would get an idea of how ranks can vary and of therefore at what extent resulting policy indications can be week. I’ve been working for quite some time on a composite indicator on eServices (eGovernment, eEducation, eTransportation, to be extended to eHealth and Smart Cities) for research project TAIPS funded by the European Investment Bank, together with my friends and colleagues Marco Biagetti, Davide Arduini and Professor Antonello Zanfei. I presented some preliminary results at the 1st EIBURS-TAIPS Conference at Urbino University (here you can find all papers and slides from the conference), in front of a bunch of innovation policy gurus including Paul David, Ian Miles, Edward Steinmueller and Keith Smith. Here is the abstract and my slides. Abstract The study aims at providing evidence on regional differences in the diffusion of ICT in the public sector in Italy, with a focus on different types of public e-services (eGovernment, eEducation and Intelligent Transport Systems). Data are obtained by merging four different surveys carried out by Between Co. (2010-11) and Istat - Italy’s National Bureau of Statistics (2009). We pursue a three-fold objective. First, we attempt to overcome the prevailing attitude to consider the various domains of public e-service provision as separate from one another. In other words, measuring the progress of digital government requires a holistic view to capture the wide spectrum of public e-services in different domains (e.g. local and national administrative procedures, transportation, education, etc.) and the different aspects of service provision (not just e-readiness or web interactivity, but also multi-channel availability and take-up). Second, we shall tackle a major drawback of existing statistics and benchmarking studies of public e-services, which are largely based on the count of services provided online, by including more sophisticated indicators both on quality of services offered and back office changes. Third, we develop a sound, open and transparent methodology for constructing a public eServices composite indicator based on OECD/EC-JRC Handbook. 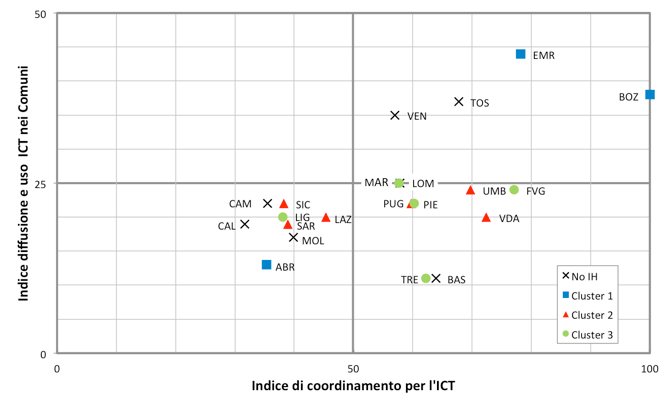 This methodology, which incorporates experts opinion into a Data Envelopment Analysis, will allow us to combine data on different e-service categories and on different aspects of their development, and will enable us to define a ranking of Italian regions in terms of ICT adoption and public e-service development. A holistic view for Public e-Services diffusion and impact: Introducing project T.A.I.P.S. One of my first posts on the Regional Innovation Policies blog was about “traditional” public e-services – as opposed to Government 2.0 new applications – and their still slow diffusion in many countries in Europe and in the world. My point there was that low take-up of public e-services, which is considered by some the main reason of the digital government failure, was probably simply due to a shortage of… public e-services. While most critics of EU e-government policy point only to the lack of interest of households and enterprises in expensive and unsustainable digital public services, I think we should also consider that today a significant number of public agencies, especially in the lagging regions of the world – fail to deliver their most useful basic public services on line. Considering e-government services, though most of them were pushed by national governments in the first years of the new millennium and are already available on the web with an acceptable level of sophistication (see for example the list of CapGemini twenty basic public services in latest benchmarking report), the situation is very different at the local level, where small agencies are struggling to provide services with less money and face complex coordination issues with scarce skills. Moreover, if we zoom out and consider advanced services from other recently-developed domains of digital government such as e-health, e-procurement, e-education, infomobility, “smart” cities, etc, the supply-related issues are manifest. In other words, measuring the progress of digital government requires a holistic view to include the wide spectrum of public e-services in different policy domains (health, transportation, education, etc.) and the different aspects of service provision (not just e-readiness or web interactivity, but also multi-channel availability and take-up). Providing this view is the main goal of TAIPS (Technology Adoption and Innovation In Public Services), a research project carried out by the Department of Economics, Society and Politics (DESP), University of Urbino (Italy) and funded by the European Investment Bank (EIB), which aims at exploring the determinants and impact of public e-services diffusion from the point of view of the Economics of Innovation. The project is lead by Professor Antonello Zanfei, an industrial economist whose interests range from innovation diffusion to industrial dynamics and economics of multinational enterprises. A few weeks ago the first outputs were released. One paper is entitled What do we know from the literature on public e-services? and provides quantitative evidence that ICT research, as it happens in policy making, still considers the various policy domains as separate silos. The next step of TAIPS will be to unify those views. A benchmarking the progress of Italian regions with a joint, e-services pilot methodology is under way. This exercise is to be eventually extended to selected EU Countries. Plus, TAIPS staff is organizing an International Conference in Urbino, Italy on April 19-20, 2012. Here you can download the outline. The deadline for abstract submission is pretty soon (on Wednesday, October 5), but will probably be extended a little bit. The conference will be interesting since many invited speakers – leading scholars in the field of Economics of Innovation and Information Technology – have already confirmed their participation. I will report again on this in the next few weeks, so please stay tuned! A study based on Eurostat data on ICT usage among individuals in Italy demonstrates that current Web 2.0 users are not interested in eGovernment, while eGovernment users are reluctant to be involved in Gov 2.0 initiatives. A change of paradigm is needed to evolve from Gov 2.0 for policy wonks to large scale participation. • the second (in darker green) tries out new technologies mainly devoted to communication and the web 2.0, i.e. blogging, social networks, on-line gaming, listening to streaming music, etc. Looking at the personal characteristics of the people belonging to the various groups, the data shows that age still plays a very important role, following a pattern that could be thought of as a ‘digital circle of life’ (purple line). Internet users, while starting this virtual cycle among the occasional users when very young, tend to move to the innovation adopters group at 16 to 25 years old, and then join the traditional group once they reach middle age. The circle is eventually closed by virtue of the fact that senior people belong to the occasional users group. As expected, the level of education (blue line) is also positively correlated to the use of the Internet, but the arrows are pointing right to center of the web 1.0 cluster. Today, who is Gov 2.0 for? Once again data shows that, on average, digital natives seem to maintain the monopoly of web 2.0, while traditional and bureaucratic on line services are generally used by completely different people, namely well-educated persons in their 30s or 40s. The difference from 1.0 and 2.0 users is even more dramatic considering e-government services. People who download public forms or use advanced on line services (“sending filled in forms”, in Eurostat vocabulary) are represented in the chart at the exact opposite of blogs creators. They are different users, having different habits and showing completely different ways to use the Internet. Gov 1.0 users do on-line banking, read newspapers on line, etc. Maybe they have responsibilities, have to pay taxes, find a new job and so on, but are probably not used to Twitter, Ning or Second Life. On the contrary, Web 2.0 people are younger and just want to communicate and play. A tremendous change in service design is necessary to meet the needs of web 2.0 people without leaving traditional users behind; a change of paradigm in fact. New services have to be co-designed with 2.0 kind of users, and a hacker mentality has to be promoted to loose the boundaries between institutional bodies and society. But today who is Gov 2.0 really for? David Osimo thinks that the existing initiatives are just for elitists – designed, he says quoting the New York Times, for Lisa Simpson, not for Bart – and that new tools are needed in order to involve him, i.e. to enable large-scale participation. Using the Simpsons to interpret the Eurostat data, Bart would be – well… he actually is! – a teenager probably just not interested in political participation and eGovernment services, or at least not yet. He would know how to use 2.0 tools to interact with Government, but he prefers to “play networked games with others” or to download illegal content on peer-to-peer networks. And Lisa, where is she in the chart? Data shows what is happening on average, and Lisa is therefore not considered. In fact, she is absolutely an exception: she is politically involved, she cares about policies (a policy wonk, someone said), while having the media literacy to be 2.0. Time is probably going to help this. It is reasonable to expect that, as the digital natives get older and new commodities and tools such as the iPad spread, more Barts are going be turned into Lisas, and the hacker/wonk mentality will eventually become more widespread. In the meantime, as Alberto points out, it is better to be ruled by a few Lisas than by Mr. Burns. Coordination between national and local policies is one of the key requirements of back office interoperability, joined-up services, Gov 2.0 initiatives. The post analyzes the delicate interaction between national and regional e-government policies in Italy from the 1990s to the present day. Effective coordination and collaboration, both across different sectors (health care, transportation, education, etc.) and tiers of government (national or federal, regional, local), is widely recognized as one of the key requirements of advanced e-government implementation. At a back office level, coordination enables, for example, inter-agency data interoperability and sharing – including better-informed decision-making – and smarter public procurement through the aggregation of public ICT demand. At a front office level, information sharing allows the realization of so-called joined-up or seamless services, often delivered by local authorities, but linked to processes or data from higher levels of government. New flows of interoperable public data can also fuel government 2.0 initiatives, extending the sharing of information not only to other government organizations, but also to the public as active participants and services co-designer. It is quite evident that policy design has a major role in supporting this process. E-government and ICT strategies should consider the coordination between central and local initiatives as the key factor preventing duplication of efforts and waste of public money, in accordance with the principle of subsidiarity. A common policy framework is needed to ensure the compliance of local initiatives with national strategic objectives, to strengthen the structures dedicated to policy governance, to develop common standards, to exchange good practices and to support the weakest local administrations in managing technical and organizational change. Indeed, ensuring that no local agency is left behind is a worthwhile public goal both from an efficiency and equity point of view. Clearly, coordination is particularly needed in presence of a highly fragmented government structure, which means complex governance. In this regard, Italy represents a good case. Italian agencies directly involved in the delivery of e-government services are more than 10 thousand: they include the ministries and other central public organizations and their local divisions, 21 regional governments, 109 provinces, more than 8,000 municipalities, plus hundreds of other local institutions such as local health care authorities, park authorities, etc. In such a scenario, the regional level has usually been considered as the ideal scale for policy intervention on these topics (actually, the debate is always open and the matter quite complex). Furthermore, after the reform of the Italian Constitution in 2001, regional governments have experienced greater autonomy on various matters (e.g. health care), which were devolved from central government to regional administrations, and are now playing a central role in defining innovation policy priorities. Today the great majority of the ICT investments in Italy are funded by regional budgets. Nevertheless, the role of the national government remains pivotal because it can promote political commitment, common strategies, technical standards and a shared policy framework. The following sections briefly examine the delicate interaction between national and regional e-government policies in Italy from the 1990s to the present day. At the national level, from 1993 to 2000 the actors charged with decision-making on ICT and the public sector were the Authority for IT in the Public Administration (AIPA) and the Minister of Public Administration. The AIPA – transformed in CNIPA (National Centre for IT in the Public Administration) in 2003 and than in DigitPA in 2009 – is a technical body with autonomy and scrutiny independence that, together with the Ministry of Public Administration shared some early competences over strategies and technical support in the development of information systems within the central administration. In the late nineties the Ministry launched a series of reforms towards efficiency and transparency of the public administration, which started to consider the ICTs as a carrier of modernization. At the local level, no formal regional plan were conceived until 1999. In the second half of the nineties the first ‘civic networks’ were created in medium-sized municipalities – traditionally the most innovative and efficient – by the pioneers of e-government, who often were just individual enthusiastic civil servants with a technological background. With the change of government in charge, a Ministry of Innovation and Technology was created. While the most advanced regions were drafting their e-government and information society plans, the Minister, together with the CNIPA, had the role of coordinating the implementation of the National e-government Action Plan (2001). The first phase of the plan culminated in a major bid for developing local public on line services (worth €472 million of national funding), through which about a hundred pilot projects were co-funded by the central government with more than 5.000 local agencies involved. The CNIPA was responsible for project selection and in-itinere evaluation, experimenting a result-driven funding. Overall, the implementation of the action plan has been characterized by a reasonably good level of collaboration between national and local levels and the importance of the inter-agency cooperation was explicitly documented in the national policies for the first time. In 2003, a document entitled A shared vision, a cooperative implementation (L’e-government per un federalismo efficiente: una visione condivisa, una realizzazione cooperativa) was approved by the Conferenza Unificata, a cooperation body representing the State, the Regions and the other local governments. Other organizational bodies dedicated to inter-institutional coordination (all created in 2002) included a Permanent Commission for e-government (Commissione permanente) composed by the Ministry and the Presidents of the Regions, two Permanent Committees (Comitati permanenti) with the representatives of the Municipalities and the Provinces, a Joint Table for e-government (Tavolo Congiunto Permanente) composed by the Minister of Innovation, the Regions, the Provinces, the Comunità Montane (associations of municipalities located in mountain areas) and the central administrations involved in the Action Plan. In 2002 a network of technical bodies was created for each region: the Regional Competence Centers for e-government (CRC), working teams designed to support the developing of e-government projects in local administrations. Collaboration between the Ministry and the Regions was facilitated by the presence of one or more representatives of both institutions in each regional team, while a central staff in Rome was assisting regional bodies in pursuing common goals and ensuring the comparability of the data collection activities that every CRC carried out to support decision-making. Once the first phase of the Action Plan was completed, a change of national government occurred. The Minister of Public Administration inherited the powers of the Minister of Innovation and Technology, in order to better integrate the actions towards the diffusion offront office e-government services with those towards the back office re-engineering. In 2006 a new commission of the Conferenza unificata was set up: the Permanent Commission on technological innovation in the regions and local administrations. In those years, the Minister of Regional Affairs also launched a second parallel national program for local e-government called ‘Elisa’, worth about €40 million of national co-funding, while the main action carried out by the CNIPA within the second phase of the Action Plan was the creation of the Alliances for Innovation (Alleanze per l’Innovazione), technical shared centers providing e-government services for small municipalities and co-financed by the central government. A lower investment from the national level compared with the resources programmed in the previous years, together with a series of delays in implementing and coordinating the second phase of the national Action Plan, increased the role of regional policies in the whole implementation of e-government in Italy. This caused, especially in the Centre-North, afragmentation of local initiatives and, in the South, a much stronger weight of the Regional Cohesion Policy in defining strategies and policy priorities. Indeed, European Structural Funds and the National Under-utilized Area Funds (FAS) have been the main (often the only) source of funding for promoting the information society in the South of Italy, with more than €1.2 billion of total funding dedicated to e-government development in the 2000-2006 programming period. An additional €1 billion is programmed for the 2007-2013 period (Structural Funds only). In January 2009 the new Minister of Public Administration launched the national plan ‘e-gov 2012’. The plan covers 27 strategic objectives and 80 different initiatives and has suffered from a shortage of financial resources due to the particular condition of Italian public finance after the crisis, though €1.4 billion has been planned to be utilized over five years. E-gov 2012 is mainly focused on the digitalization of central government; however, some initiatives must be implemented in cooperation with the local government, e.g. the integration of the municipal registers with the real estate cadastral system and the regional topographic database. Even if the previous bodies dedicated to central-local cooperation remain active, the cooperation between national and local governments has been realized mostly through the signing of several protocols of understanding between the Department of Innovations in the Public Administration, representing the Minister, and each single local government. According to the e-gov 2012 official web site, to date 23 protocols have been signed with local administrations (4 regions, 5 provinces and 16 municipalities). The regions’ need to converge upon a common framework gave rise to the proposal of a plan named e-gov 2010, approved by the Inter-regional Center for IT, Statistical and Geographical Systems (CISIS) in March 2009. The plan, originally conceived as an anti-crisis measure, put at the centre of regional policy inter-regional cooperation in order to prevent the duplication of the technological platforms, solutions and services developed at the local level. In April 2009 a protocol of understanding between the Minister and the Conferenza delle Regioni e Province Autonome, another body representing the Italian Regions, is aimed at fostering a constant dialogue through the creation of permanent links between the two levels of government. A similar document has been signed with ANCI, the National Association of Italian Municipalities, introducing more concrete actions such as the promotion of the certified e-mail and the national projects Linea Amica (a unified call-center of the whole Public Administration) and Reti Amiche (aimed at improving the delivery of public services by multiplying the access points, e.g. the involvement of banks and tobacconists). While at the European level experts, practitioners and policy-makers are debating the role of the web 2.0 in public services and while most of the advanced OECD countries are delivering policy drafts and reports on the so-called Government 2.0, many Italian local Public Administrations are having difficulty in delivering not only Government 1.0, but in some cases even a beta version. 3. to enhance the effectiveness and efficiency of the Public Administration. The first objective in particular seems to meet some of the requests of web 2.0 enthusiasts, who are asking for a more active role in terms of co-designing public services and accessing public information; having in mind, for example, a European version of the American data.gov portal, they perceive open collaboration with government as a way to create new user-generated services and foster transparency (see for example the open declaration on the role of web 2.0 in public services). In this regard, a key passage of the document emphasizes the importance of the availability of public sector information for reuse: “New demand-led information products and services enabled by the reuse of public sector information will support the transition of Europe to a knowledge-based economy”. However, from a strict Government 2.0 point of view, the Declaration as a whole is still mainly dedicated to ‘traditional’ eGovernment and, rather than a revolution, it appears to be (frankly, as expected) the result of a compromise between the ‘old’ and the ‘new’ way of thinking about innovation in public services, or, perhaps in fairer terms, some sort of ‘step-by-step’ innovation strategy. As Andrea DiMaio pointed out in a recent post, this impression is somehow confirmed by the fact that “the publication of the most recent e-government benchmark, which is the first outcome of the renewed contract between EU and Capgemini, shows a disappointing continuity with the old e-government approach”. Is this actually bad news for public sector innovators? Is this ‘new’ and fashionable view of eGovernment the defining solution to the many challenges that European Public Administrations are facing? Yes, in many ways it is; this ‘new’ approach is undoubtedly a step in the right direction and its role in the declaration could definitely have been more significant. Co-designing of public services and open government, in particular, could force the Government to bring innovation to the next level and even trigger further improvements in efficiency and the effectiveness of Public Administrations. Obviously, however, this should not be the only solution, at least for Countries of the Eastern and Southern Europe that are still engaged in developing digital infrastructures and delivering most of the basic public services on line. Italy is certainly part of this club. Far from delivering web 2.0-like services or sharing public databases on the web (with some exceptions, of course), Italian PAs, especially at the local level, still do not have the technological and organizational ability to complete the delivery of a mature e-government transformation even at a “1.0” level, mainly because the italian local administration is fragmented into thousands of independent agencies and there is no efficient national data exchange framework for inter-agency information flows. The latest data collected at the EU level highlights this gap. According to the Eurostat chart published on 8th August 2009 in the European Commission Digital Competitiveness Report on i2010 strategy, Italy appears in 22nd position out of 27 Member States for take-up of advanced public services among both citizens and enterprises, i.e. those services that allow the final user to complete a transaction via the web, otherwise called ‘self-services’. Eurostat statistics show not only an alarmingly low e-readiness rate among Italian young people compared with their counterparts in the rest of Europe, but also specific difficulties when using advanced public services via the web. While waiting for fun and interactive web 2.0 public services, it is obvious that no take-up is achievable if most Public Administrations fail to deliver their most useful basic services on line. Indeed, the principal determinants of this low take-up rate can be found not only in the demand-side aspects like low broadband penetration among households (steadily lower than the European average) or the high proportion of elderly people normally excluded from digital technologies, but also, even now, in the scarcity of the supply of on-line services. As stated in the last 2009 CapGemini Report, which has been measuring public services availability since 2005, in 4 years the position of Italy among the other Member States has dropped from 9th position in 2005 to 17th position out of the 27 EU Countries in terms of full on line availability. Those results could be even worse if the sample of the analyzed services were less biased toward those delivered by the central level and therefore easier to design and implement. The report measurement approach, having to deal with 27 different institutional organizations and therefore to choose only the services that all Member States have in common, includes only a few of those key services that in Italy are only offered at the local level by 8,100 different and independent municipalities, more than a hundred Provinces and 21 Regional Governments. It is at this level that the situation becomes difficult. The latest results of the survey on ICT in the public sector by the Italian National Institute of Statistics (ISTAT) show that, in 2007, only 3% of the local public administrations were able to offer at least one transactional service out of dozens that would be expected. In the above graph supply and demand of some of the key public on line services are compared. The data on availability of local e-government services is based on the results of the survey by CNIPA and DIT described in a previous post; the chart shows the percentage of individuals living in municipalities that are able to deliver the service on line at least as a downloadable form (stage 2 of the Capgemini classification). 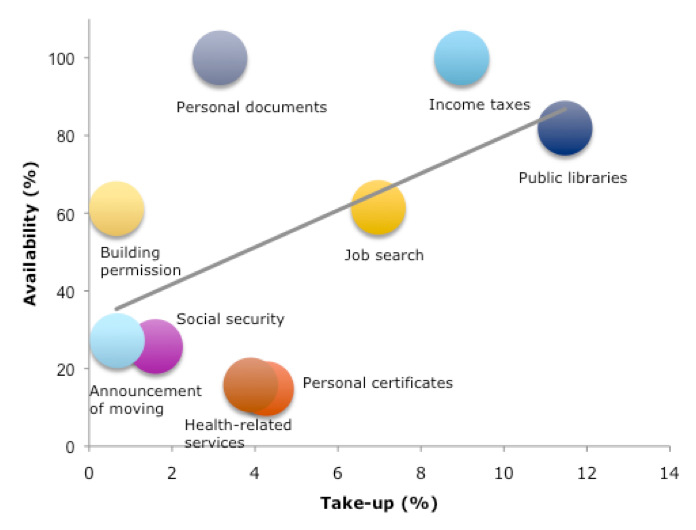 Take-up is described using the last available data by single service from the ISTAT survey on ICT usage among individuals, special module on e-government (2006). The reported usage refers to the number of individuals who have used the the service via the web in the last 3 months, expressed as a percentage of all Internet users over the same period. It is quite clear that those services with higher take-up values tend to show high availability percentages. In particular, it seems that local Public Administrations need to deliver a service to more than 50% of individuals in order to obtain more than 5% of take-up. Moreover, the ISTAT data reveals that those services with the lowest availability rate show the highest values of potential use. More than 60% of the interviewees, for example, would like to be able to notify moving house if the service were actually available. In conclusion, this simple exercise may be enough to prove that there is still much to be done in order to achieve full availability of local public eServices in Italy as well as in other less-advanced countries in this field. Those who are concerned about the low eGovernment take-up levels should therefore consider that these levels, in some cases, may be determined just by a scarce availability and quality of the basic on line services. So the ‘old’ approach to ‘traditional’ eGovernment which is prevalent in the European Declaration might sound outdated but it is, at least in some countries, still a must. This report has been presented at ForumPA conference in Rome on 13th May 2009. The research is carried out by the staff of the Regional Centers for eGov at CNIPA and funded by Italian Presidency of the Council, Innovation and Technology Dept. The results of the survey show that there is still much to be done in order to achieve full availability of local public eServices in Italy. On average, 11.1 out of 43 services included in the survey are actually available to citizens and enterprises in the 1,112 municipal territories with more than 10,000 inhabitants (25.6%). Only 37% of the services analyzed can be considered real transactions (full electronic case handling), while most of them are merely downloadable forms. This result certainly stresses how difficult is for local P.A. to provide efficient services on line. However that might also reflect the actual behavior of the final user, who might be just looking for information and not requesting the implementation of costly transactional platforms. Previous studies have shown that interactivity of eServices should not be measured using discrete stages, since it does not really reflect a linear progression from information to transaction. This survey, which detects the simultaneous presence of 10 attributes of the service, helps to assess the overall quality, reflecting the true functioning and usage of each single service. In particular, new dimensions of interactivity are considered, such as the presence of public accessible on line databases (i.e. public libraries catalogues). The survey adopted a user-centered approach in its search for eServices. All public and private websites were surveyed in order to find and analyze the 43 local on line services included in the sample. A significant share of eServices is offered through websites not directly managed by local institutions often considered in previous surveys such as Regional, Provincial and Municipal Administrations. The variety of eServices available might disorient the final users, thereby jeopardizing the web credibility of public websites. The role of institutional websites of the Italian municipalities – the closest institutions to the final users – is considered crucial by local and national policy makers in order to include the largest possible number of citizens in the development of the Information Society. The data shows that the institutional websites of the municipalities no longer represent the main channel for providing municipal service s via the web. Many other local websites have taken their place: 60% of the transactional on line services analyzed are offered by the websites of other public and private organizations such as companies for tax collection, shared offices dedicated to enterprises, portals of e-government projects, regional portals. If the actual availability of the services is considered from a user-centered point of view, it becomes evident that those municipal eServices offered in an “aggregated” way – through a single website but directly available to individuals and enterprises operating in more than one municipal territory – show a much higher impact than the solutions developed by individual municipalities. This impact is estimated to be, on average, from 5 times higher for e-government proje cts websites to 50 times higher in the case of portals handled by Regional Administrations. This result underlines the well known need to avoid duplication, i.e. for the development of similar solutions in similar territorial contexts (there are more than 8,100 municipalities); this drives the requirement for more coordinated actions at Regional and National level. As a consequence, the services that demonstrate a higher level of availability are regional or provincial services (i.e. job related) or are municipal services provided in an “aggregated” way (i.e. local tax payment). The number of available services per municipal territory varies from 0 to almost 20 services out of 43, with an average of 11.1. The presence of a large number of territories with few or no available services proves that the implementation of local e-government in Italy is still far from complete. The report analyses some of the determinants of this digital divide in eServices provision. • The size of the resident population in the municipal territories does not dramatically influence the number of available services. Even though a correlation exists, the survey found the presence of a number of isolated cases of high performing territories among small or medium-sized municipalities. • The level of financial independence of the Municipal Administration, since a more autonomous financial regime tends to increase the willingness to invest in innovation, also affects eServices provision. • Finally, the participation in e-government projects co-funded by the National Government from 2002 to 2007 has undoubtedly helped Local Administration to foster public services provision via the web. Further research is needed to evaluate not only the effectiveness of the connection of those front office platforms to back office processes, but also the long-term financial sustainability of the projects together with the actual take-up and user satisfaction. 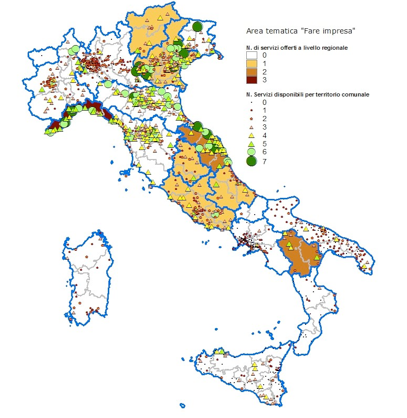 There is considerable variation in the quality of eServices provision among the municipal territories of the Italian regions. This variation is mainly due to the ability of each Regional Administrations to offer its services on line and to involve and coordinate the other local institutions in shared projects. Italian Regions also present different models for eServices provision. In some Regions (such as Campania, Emilia-Romagna, Molise and Calabria) the prevailing type of provider is the institutional website of the Municipalities, while in other Regions (such as Liguria, Abruzzo, Basilicata, Marche) the services are offered predominantly at Regional level. The survey revealed that in three regions – namely Abruzzo, Marche and Sardinia – e-government shared portals played a major role in the provision of on line services, largely as a result of the co-funded projects in the 2002-2007 period.